Bushiro Mohri (1923-2004) is one of the most distinguished sculptors in postwar Japan. This exhibition focuses upon his previously unexhibited work including plans, notes, and objects that seem to inspire the approach towards his later metal works. Born in Tokyo in 1923. Graduated from Tokyo University of the Arts in 1943. Started artistic career in the early 50’s and played an active role in the Japanese art scene, exhibiting at a number of high-profile venues including The Museum of Modern Art, Kamakura; The National Museum of Modern Art, Tokyo; and The 5th Sao Paulo Biennial. From early 1964, however, Mohri suddenly stopped presenting new works in public and went very quiet for nearly 20 years until 1983. Moved to rural Kurobe in Toyama Prefecture from the middle of Tokyo in 1992 for larger studio space and started creating new works using industrial lathe machines on a full scale. After a major solo exhibition showing 111 works including later metal practices at The Museum of Modern Art, Toyama in 1999, his work has returned to public prominence but still remains enigmatic. 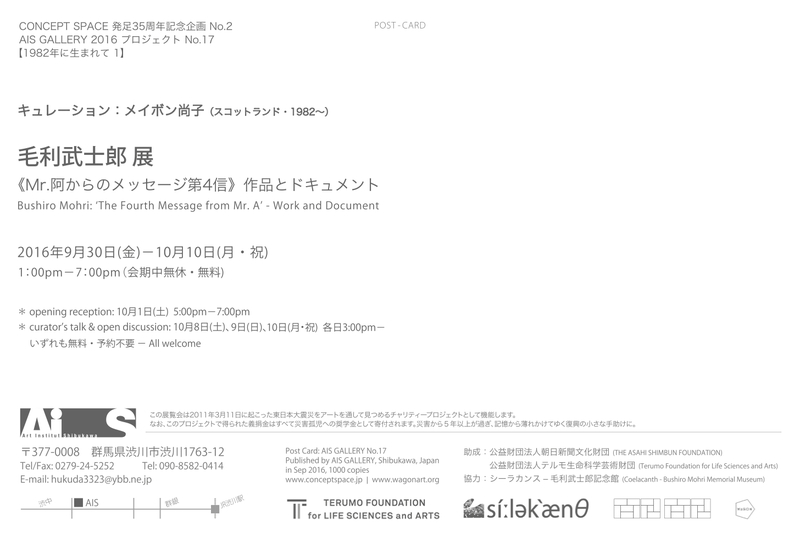 Supported by THE ASAHI SHIMBUN FOUNDATION and Terumo Foundation for Life Sciences and Arts. A brochure was designed and printed to accompany the showcase. Please visit here for more details. This entry was posted in Exhibition, Information, News. Bookmark the permalink.